Soya chunks kurma or meal maker kurma recipe , an easy side dish for biryani, pulao, chapathi or phulka. 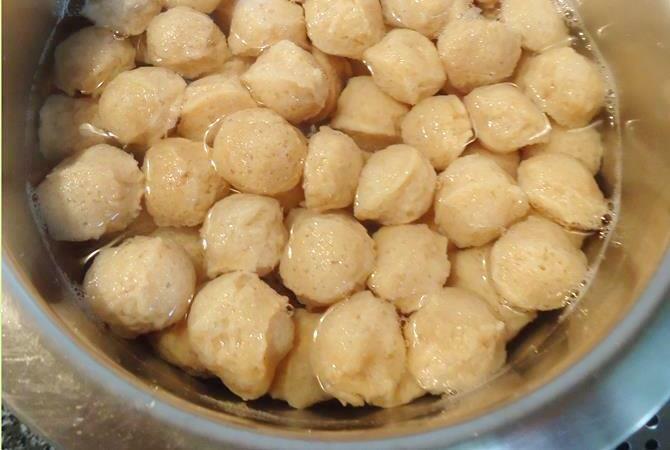 Soya chunks also called as meal maker or soya nuggets are low in fat, high in protein and many other nutrients. Hence these make a great food for growing kids, pregnant women and diabetics too. 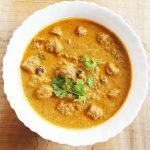 Soya chunks kurma curry was made during last june in India, since poppy seeds are available there I have used, but can be skipped or substituted with cashews. Kurma can be made without coconut, poppy seeds or cashews or roasted gram like I made this potato kurma. Yogurt can be used instead of the above mentioned ingredients. 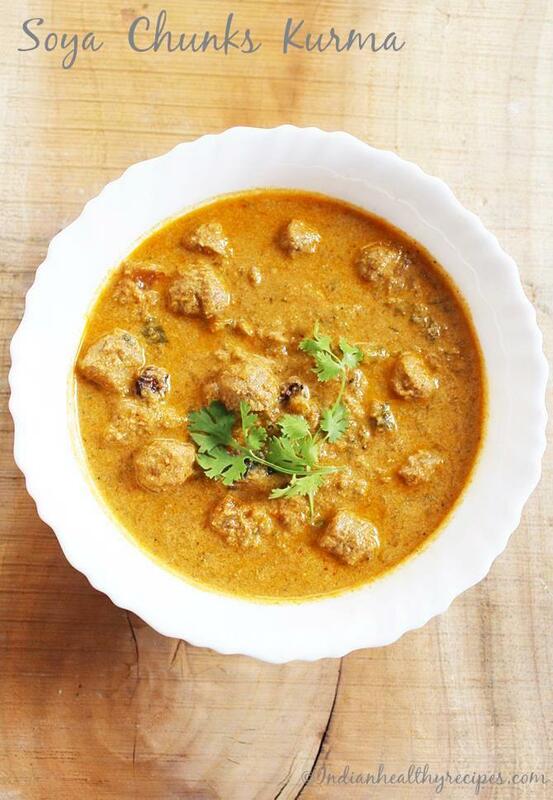 Soya chunks kurma gravy made with vegetable textured protein nuggets. A coconut based curry to serve with rice or roti. 1 tsp ginger garlic paste or grated ginger garlic. Heat 3 to 4 cups water, add soya chunks. Switch off the stove. Leave them to soften for about 10 minutes. Squeeze off the water and rinse them in lot of water. Repeat squeezing them. Make sure there is no water left in the chunks. If you desire you can cut the chunks to half or use them as it is. Marinate them with 1 tsp ginger garlic paste, 1/4 tsp garam masala, 1/4 tsp red chili powder, salt and lemon juice. Set this aside until needed. Chop onions, tomatoes, set them aside. If using poppy seeds, dry roast them until crunchy. 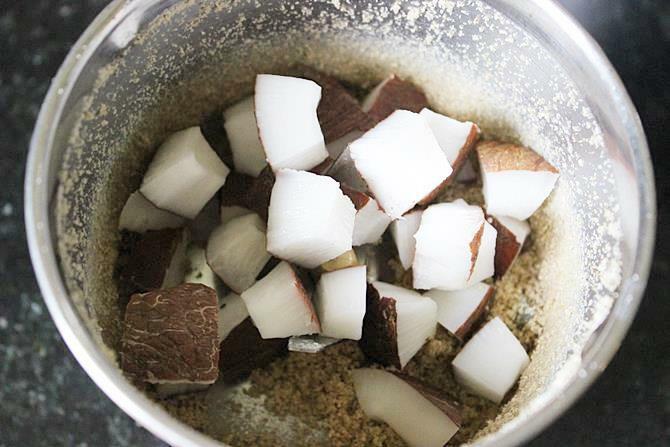 Powder them first with saunf and then add the coconut with very little water to make a thick paste. Heat a pan with oil, add the dry spices. When they begin to sizzle, add onions and green chilies. Fry till the onions turn golden. Add tomato and fry till the tomato turns mushy. If needed sprinkle water to cook tomatoes. Add marinated soya chunks, coriander and mint leaves. Fry everything well till the raw smell of the ginger garlic goes away. Stir well to prevent burning. If needed use little more oil. 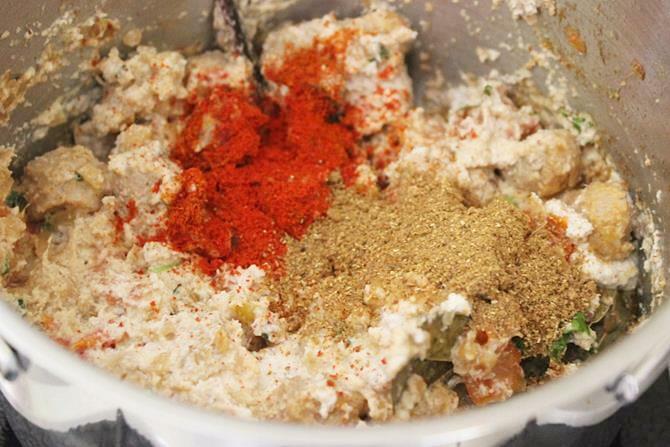 Add the ground coconut paste or yogurt if using yogurt as a substitute to coconut paste. Then add red chili powder, garam masala, coriander powder. Mix and fry well for about 3 to 5 minutes, till you begin to get a nice aroma. Pour water just enough to make a good amount of kurma gravy. Adjust salt as needed. Simmer and cook till you get the desired consistency of gravy, for about 5 minutes. 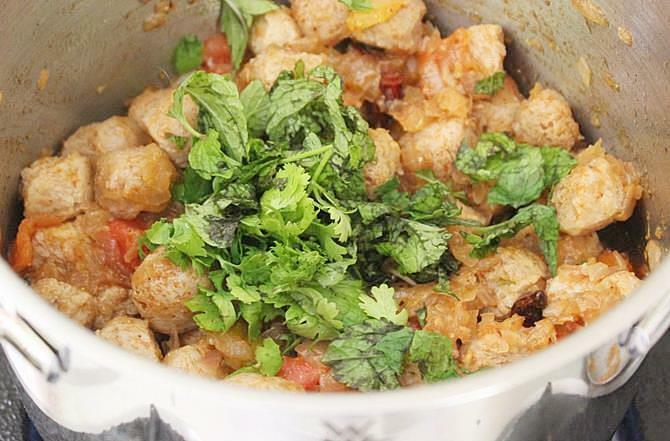 Garnish soya chunks kurma with coriander leaves. Serve with rice or roti. The ingredients under "to grind" can be skipped and only yogurt can be used. If using yogurt, powder saunf and use it with the garam masala. 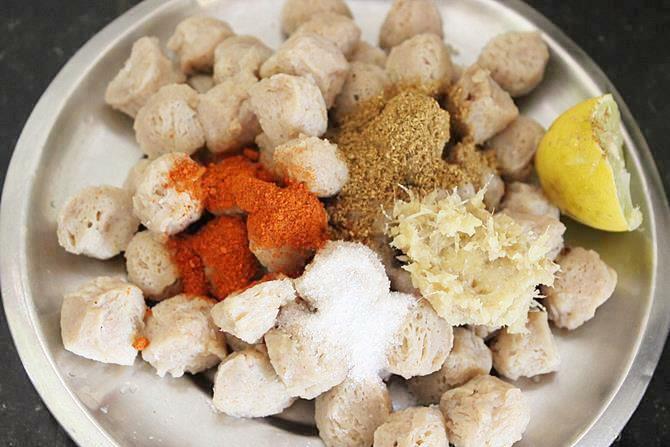 To easily powder saunf, add it to a blender along with the garam masala and make a fine powder. 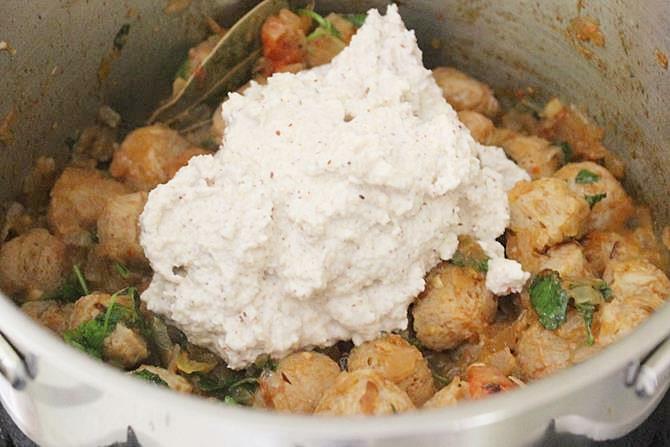 How to make soya chunks kurma or meal maker kurma. 1. Add soya chunks to hot water and let them soak till they soften. Squeeze up the water and rinse them in water and squeeze off excess water. If desired you can chop each chunk to 2 pieces. 2. Add soya, salt, ginger garlic paste, red chili powder, garam masala and lemon juice to a bowl and marinate the soya chunks. Keep this aside till we use. 3. This step can be skipped if using yogurt alone for the kurma. If using poppy seeds, dry roast or sundry them till crunchy. Add poppy seeds or cashew nuts along with saunf to a blender jar and powder them finely first and then add the coconut and make a fine paste with little water. Set this aside. If you do not have a good blender, don’t use poppy seeds. 4. 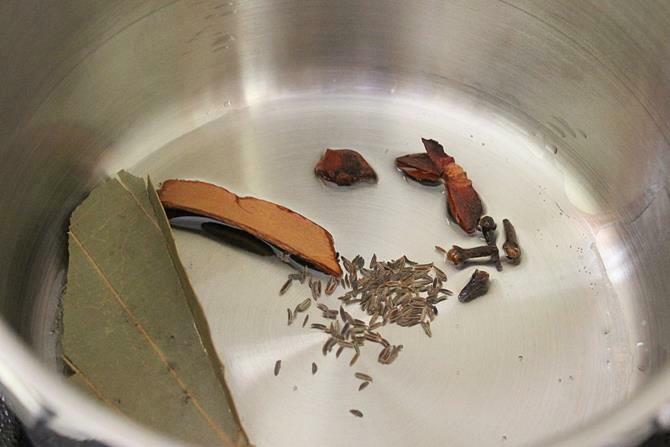 Heat a pan with oil, add bay leaf, cardamoms, cloves, cinnamon, shahi jeera or jeera and star anise. You can skip using star anise, if you don’t have. 5. 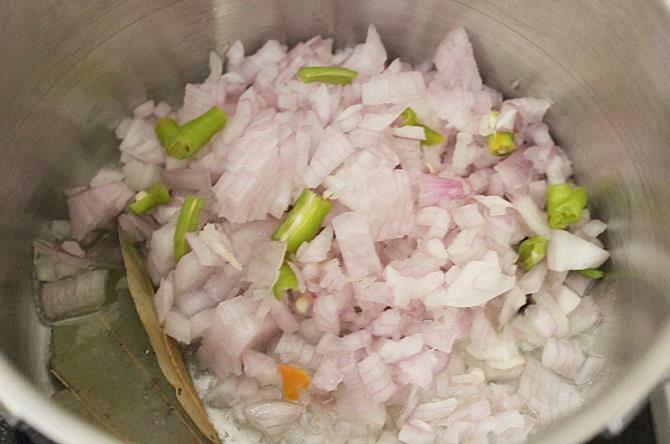 When the spices sizzle, add onions, chilies and fry till they turn golden. 6. Add tomatoes. My tomatoes were not juicy, so I sprinkled little water and salt to soften them. 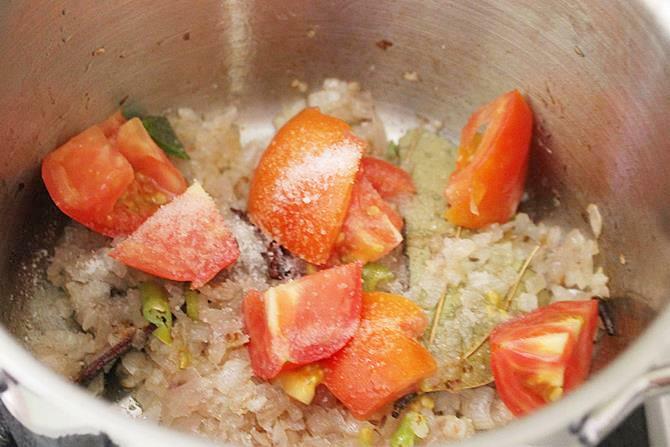 Cook till the tomatoes turn mushy. 7. Add the marinated chunks along with mint and coriander leaves. Fry till the raw ginger garlic smell vanishes, for about 5 minutes on a low to medium flame. I used a spoon oil to prevent them from burning at this stage. 8. Add yogurt or the ground coconut paste. If using yogurt, add saunf, garam masala and coriander powder to a blender jar and powder it, an easy way to powder little saunf. 9. Add red chili powder, coriander powder, garam masala powder and fry again for 3 to 5 minutes or till you get a good aroma of the masala. 10. Pour water as needed to get a gravy. 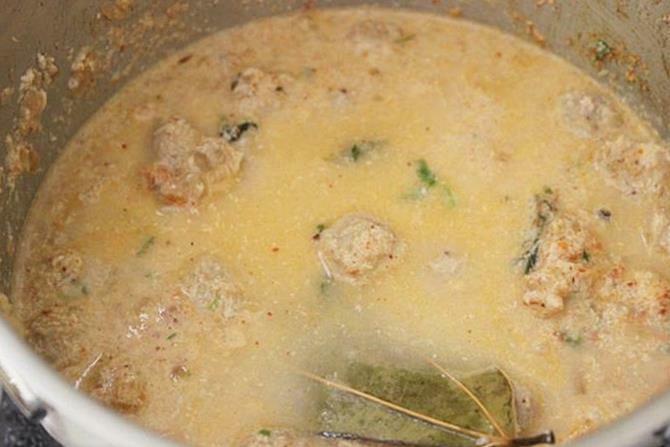 Do not add too much water, it will thin down the soya chunks kurma. Check the salt and add if needed. If using only yogurt, you may not need much water.Cover and cook till the chunks are soft and the gravy turns thick enough to suit your taste. Serve soya chunks kurma with biryani, pulao, phulka or chapathi. Hi, Thank you for posting this yummy recipe.. I really loved this one..
Nice taste, I had this with phulka. My gravy became few thin, what can I do to have thick gravy. If using daliya then how much & when to use. I tried your fish fry recipe last weekend. Will be sharing it soon on the blog.